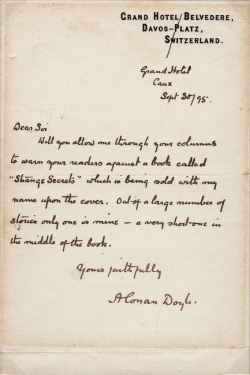 Strange Secrets is a letter written by Arthur Conan Doyle on 30 september 1895, first published in The Critic, New York, on 26 october 1895. Conan Doyle is referring to the 1895 R. F. Fenno & Co. edition of Strange Secrets Told by A. Conan Doyle and Others including The Secret of Goresthorpe Grange. Will you allow me through your columns to warn your readers against a book called "Strange Secrets," which is being sold with my name upon the cover? Out of a large number of stories, only one is mine — a very short one in the middle of the book. Will you allow me through your columns to warn your readers against a book called "Strange Secrets," which is being sold with my name upon the cover. Out of a large number of stories, only one is mine — a very short one in the middle of the book. This page was last edited on 14 July 2017, at 10:44.